Poppa’s Wine & Spirits in Oxford, Mississippi had a business plan: to become the most high-end wine shop in the state. Poppa’s owners set off on an extensive search to find the perfect company to bring their vision to life. 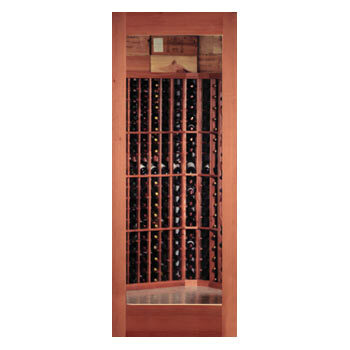 Finally, Poppa’s owners found Vintage Cellars online, and saw that we offer commercial wine racking, and also free designs. They contacted us to come up with the perfect layout for their store. When we visited, we were immediately struck by the size we were working with: the space was enormous! We immediately got down to the business of working out a design that utilized that huge space in a way that was both beautiful and functional. 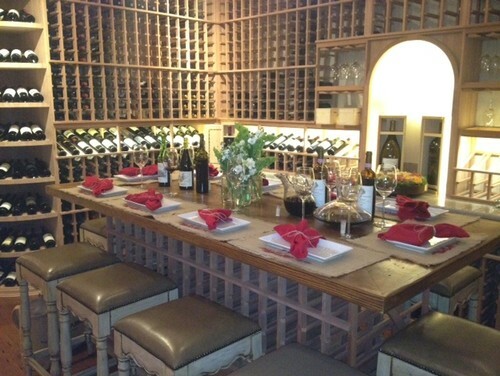 The room had to flow, with comfortable aisle width between the display racks, yet the wine had to be the main focus of the visit. In addition, wine is not the only thing Poppa’s offers. High end spirits is the second focus of the store. We had to make sure to work those bottles into the design in a fluid way. Using the concepts we’d discussed and the space provided, we worked together to lay out a store that would allow for the maximum number of bottles possible to be on display, while also being comfortable and easy to navigate for the customer.The final design surpassed all of our goals. 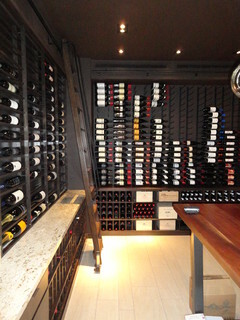 The racks hold more than 4,500 bottles. Unique circular racks catch the customers’ eyes and invite them to move farther into the store. 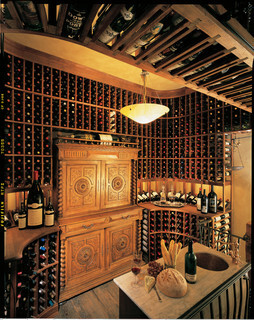 Well-designed island racks make the wine easy to access, inviting customers to read the labels and pick up the bottles. We also designed a “high end” wine section using Vintage View racks that is temperature and humidity controlled, keeping the store’s (and customer’s) investment safe. Not forgetting that wine wasn’t the store’s only focus, we created an area along one of the walls to showcase the store’s liquor collection. Poppa’s topped off the new space with an eclectic mix of art hung from the walls and displayed around the store. The final effect is at once both upscale and inviting. It’s a space we’d love to pop into for a few bottles and chat with the friendly staff, and we’re sure their customers feel the same way. 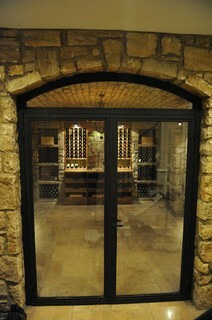 Looking to add a subtle, yet show-stopping accent to your wine cellar? Consider a gorgeous, custom wood floor…made entirely from reclaimed barrels and tanks. Fontenay, the world’s original source of reclaimed wine barrel flooring, installs one-of-a-kind wood flooring that tells a story of winemaking in the very grain of the wood. Imagine a floor that displays remnants of wine names, dramatically dispersed amongst the planks. With a custom floor made from reclaimed wine barrels, you can go for this or any other look you desire, from streamlined planks in matching hues, to a beautifully rustic mismatched look. There are several distinctly different types of Fontenay flooring to choose from. Fontenay collects barrel heads, and turns them into three different materials. The first is the Cooperage collection, which is the outside of the barrel head, complete with the special patina earned from age, as well as stamps and brand markings that winemakers have put on the barrels. The second type of material is the Wine Infusion collection. This wood comes from the inside of the barrel, and so has been naturally stained with the color of the wine the barrel held. Different types of wine deliver different colors and tones, so a Wine Infusion collection floor can represent a stunning variety of all your favorite varietals. The third type of material is the Stave collection. This collection comes from the outer part of the barrel, from which the hoops have been removed. Stave flooring comes in an interesting and eye-catching pattern made from long and short pieces, with natural markings from the barrel hoops. Not only is a floor made from reclaimed wine barrels beautiful, it’s eco-friendly, too. In the United States, most wine barrels are made from beautiful white oak, which can take hundreds of years to grow. But the life of a wine barrel ranges from a mere one to five years, and large vineyards can use as many as 100,000 barrels per year. If you choose Fontenay flooring, you can feel good about making a flooring choice that’s good for the planet, as well as a unique and gorgeous design. Whether you’re a casual collector who keeps a couple of bottles around for special occasions, or a serious aficionado who has a custom cellar packed with carefully-catalogued wine bottles, one of the keys to maintaining your wine collection is learning about the different types of wine rack styles available. Wine racks hold bottles, of course, but they can also help provide the optimal conditions for wine aging, as well as adding a touch of beauty to your wine collection. What does a wine rack do? You can’t store wine properly just by putting it on any old shelf. This is because wine racks are designed to keep your bottles stored at the proper angle. The right angle of storage ensures that the cork is completely covered in wine, preventing it from drying out. A dry cork can interfere with the oxygen levels within your wine, interfering with the aging process or even causing your wine to go bad. Most wine racks resemble shelves, so if you’re going for an aesthetic that’s a little unusual, hanging wine racks might be the right choice for you. 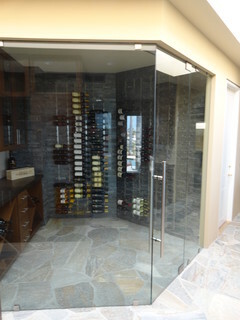 Hanging wine racks showcase a column of floor-to-ceiling shelves that display wine racks horizontally and parallel to the floor. Since hanging wine racks don’t display bottle facing outwards, they take up far less room than traditional wine racks, and so are often ideal for kitchens or other smaller spaces. Hanging wine racks store bottles at the appropriate angle for aging, and also have the added advantage of allowing the label to be clearly displayed, making finding the right bottle a simple task. Another unique choice is metal lattice wine racks. If you’re on a budget, or just appreciate a clean, simple aesthetic, these might be the right choice for you. 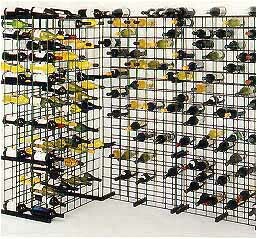 Metal lattice wine racks are a set of interlocking, heavy-gauge wire shelves. Available as a kit, metal lattice wine racks are a great choice for a do-it-yourselfer. Each kit holds 150 bottles, making metal lattice wine racks a great choice for the avid collector. Metal wine racks are also a great choice for commercial wine sellers, because they are cost-effective and easy to set up and move around. 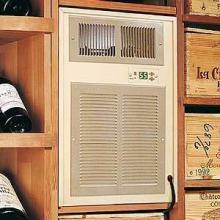 Many commercial wine sellers choose to use metal wine racks for their back-room storage, and more traditional wooden wine racks in their retail section. 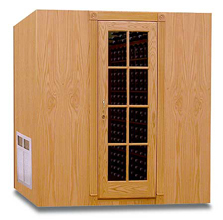 We carry a wide variety of wine racks designed for retailers. 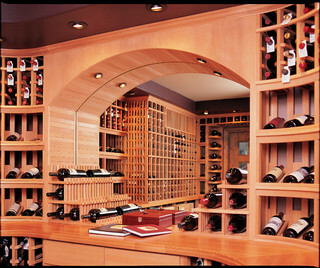 Do you love the look of custom wine racks, but shy away from the price tag? Stackable wine racks may be the best solution for you. Stackable wine racks don’t have the high price tag of custom wine racks, but they can be modified to fit your space much better than a wine racking kit. Stackable wine rack sets come in a choice of elegant wooden finishes, and offer a variety of different styles that you can mix and match to fit seamlessly into your space. 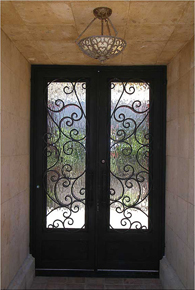 There are wide and narrow column-style wine racks, curved wine racks for corners, “waterfall” shelves that add visual interest, and even arched wine racks for over doorways. 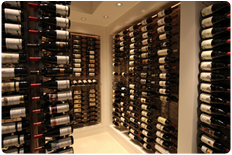 By choosing a set of the right stackable wine rack pieces for you, you can create a beautiful, customized wine cellar look without the high price.